A former World Backgammon Champion from Denmark, Mads Andersen, has powered to the title of EPT Copenhagen Champion 2006 after a relentless display of aggressive poker. This Danish home victory and the backgammon connections have also led to a few comparisons being made with another Danish former World Backgammon Champion, Gus Hansen. So, how did Andersen do it? After the hustle, bustle, and jostling for position on days 1A and 1B, the remaining 97 players entered the arena as one and got down to the proper business of playing poker for the cash prizes, of which there were to be 27 paid places, the first place receiving just over Dkr2,500,000 (approximately £235,000). At the top of the tree at the start of play was relative unknown, Marc Naalden with a whopping 120,000 chips, followed by English players, Xuyen "Bad Girl" Pham and Ram "Crazy Horse" Vaswani (he of Hendon Mob fame) with 89,000 and 72,000 respectively, give or take some change. Meanwhile, propping up the list was Austrian, Josef Kollaritz with around 4,000, with a herd of small stacks not far above. They would be aiming to get busy quickly. The early action was frantic and eliminations came thick and fast. Ram Vaswani took advantage to build on his good opening day and, on the same table, Scotland's Tony Chessa also got busy, both eliminating opponents as they worked. In form Austrian, Christian Grundvig, fresh from an 8th placed finish and $117,000 payday at the WPT Main Event 2006 Pokerstars.com Caribbean Adventure two weeks ago, demonstrated that poker is sometimes a matter of chance, by tripling up with JJ against QQ and AA, catching a J on the flop. 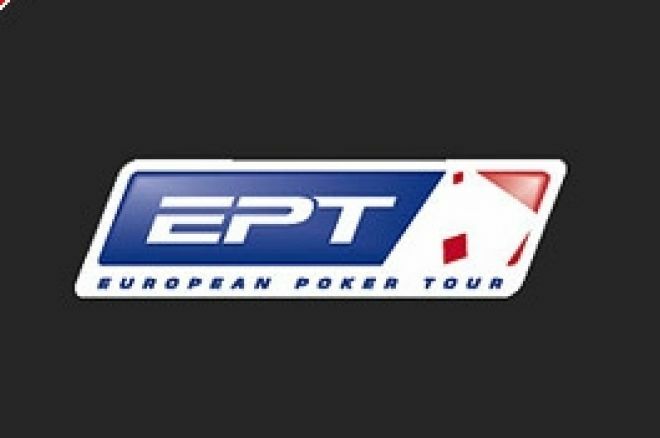 Now armed with a shedload of chips, the experience gained from the recent success and a 4th placed cashout at the EPT &euro;4,000 event at Baden in October, could represent a genuine threat to the remaining field. Standing proudly astride the whole scene at this point still was Marc Naalden, making good use of his pile of chips and catching the cards when needed. He now found himself with 250,000 in chips and ahead of the rest by a small distance. Soon it was "getting down to business" time as the dreaded bubble places approached. With just over 30 players remaining, pre-tournament fancies such as Ram Vaswani, Julian Thew and Noah Berken were decently placed with chip-stacks not too far short of the 100,000 mark, but some way short of the chip leaders. Of course, several other big names had gone down in flames on their respective opening days. Local top man Gus Hansen, Aussie WSOP champion Joseph Hachem, and Dutch crooner, Marcel Luske, to name but three. By this time, the eventual winner, Mads Andersen, had come up on the rails in jet-propelled fashion, having started the day with a stack of under 20,000 chips. Now, through aggression and the right cards, he was now past 250,000! Julian "Yoyo"Thew just made it to the money - somehow to be expected of a man in his current run of form - but sadly for him hit the buffers with an open-ended straight draw that failed to materialise. Internet re-buy qualifier and local, Anina Gundesen, having come back from the felt on Day 1B, also made the money, as did Noah Berken. Like Julian Thew, he was unable to hold on, suffering two showdown defeats, to end his interest. Going strong still was Xuyen Pham while Mads Andersen was clearly leveraging his large stack to good effect and speeding ahead in the chip count to nearly 600,000. Going the other way was Ram Vaswani, who lost out to a rivered straight and exited the tournament. Another Dane making a charge was Phillip Hilm, accumulating well to find himself in Andersen's slipstream - until Andersen charged on again to 800,000. There is no doubt that the Danes are embracing poker in the wake of Gus Hansen's exploits. There were some nice contrasts in the strong Danish contingent, who were doing their country proud in Copenhagen. In particular, Mads Andersen is a man at home with high stakes games, with a strong backgammon history and no mean poker experience. Then there is Anina Gundesen, here by way of an internet qualifier. It is the stuff of poker dreams. Early on in final day play, Gundesen made more progress using her KK to eliminate the short-stacked Johan Bergquist in 8th. The next out was not so expected, Shek Chi Hung of Denmark, who mis-timed an all-in manoeuvre against Hilm's JJ hand. Phillip Hilm had by now picked up some sizeable pots to have almost half the chips on the table and twice those of Mads Andersen who had taken a few hits. Hilm himself took a small hit doubling up Edgar Skjervold before eliminating Anina Gundersen in 6th place for a very useful £36,500 return on her internet investment. At this stage, Hilm held 850,000 against Mads Andersen's 660,000 and Skjervold's 633,000. Gonsalves and Naalden were now short on a little over 200,000 each. Gonsalves exited in 5th when his A9 failed to catch a card against Hilm's pocket pair. While successful there, Hilm's next call with pocket 4's came unstuck and Marc Naalden doubled up with his superior pair of aces. Andersen then made a strong move on the turn to take a chunk from his main rival, Hilm, which signalled another aggressive run from Andersen. A nasty river beat dealt a blow to Marc Naalden and helped Hilm regain some ground, but it was not to be. Hilm exited in 4th at the hands of Andersen. The excitement was building. Suddenly Marc Naalden was running away with the chips after doubling up through Andersen, who became short stack. But this being poker, and every contested hand seeing a mountain of chips in the middle, Edgar Skjervold was next to take the lead. A little later, a big QQ doubled Andersen up against Naalden. He repeated the dose with 9 10 against AQ. The 10 hit the board and Naalden was out in 3rd place. Heads up became a slog between evenly-balanced opponents until Skjervold took a big lead hitting his undercard with a hand of A5 against AQ. But back came Andersen hitting top pair on the flop which Skjervold promptly bluff-raised all-in, and was called. It was downhill for the Norwegian from there. Finally he was all-in with A 10 only to be dominated by AQ. It was all over. Congratulations to Mads Andersen who we are sure to see more of in future.